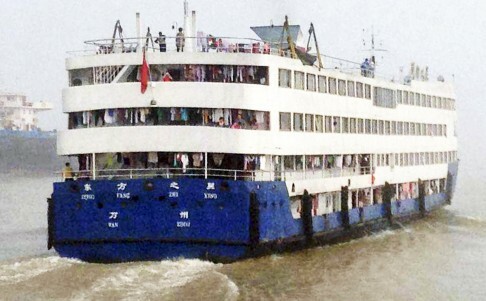 Close calls with tragedy on the Yangtze River – divine intervention saved a few hundred lives? Sunken boat Eastern Star was seen in the Yangtze River before it capsized. The captain of a passenger ship that was near the Eastern Star when it capsized on Monday night said his vessel narrowly escaped the same fate, according to a mainland media report. The captain, identified only by his surname Li, told the Shanghai Morning Post that his passenger ship, the Jiangning, was sailing through the Jianli section of the Yangtze River at about 9.30pm on Monday, when the Eastern Star capsized. Li said the Jiangning’s radar indicated “something was wrong”. A storm descended so he decided to slow down, drop anchor and wait for the bad weather to pass. But the Eastern Star, which was travelling in the same direction as the Jiangning, continued on down the river, according to the report. “The Eastern Star proceeded about 200 metres farther when the Jiangning anchored,” the report quoted Li as saying. As the storm grew stronger, Li thought the Eastern Star would turn back, but it disappeared from sight and he could not get a response from crew members on the vessel over the radio communication system. “I thought that the Eastern Star had returned to safety,” he said. The Jiangning continued on towards Chongqing about one hour later when the storm died down.